The presented results characterize nanoparticle formation in n-Si(100) samples implanted with 50-keV 64Zn+ ions (the dose is 5 × 1016 cm‒2) at room temperature followed by heat treatment in an oxygen or nitrogen atmosphere at temperatures of 400–900°C. Defects and zinc concentration profiles are investigated via the Rutherford backscattering spectroscopy with the help of the channeling technique, in which 1.7-MeV He+ ions are scattered at an angle of 110°. The silicon surface layer is visualized using a transmission electron microscope equipped with an energy-dispersive microanalyzer. The surface topology of the implanted and annealed samples is studied via atomic-force microscopy. 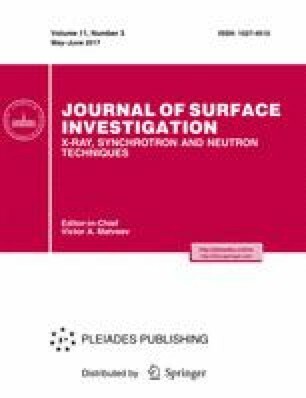 The implantation process is accompanied by the formation of a 150-nm-thick amorphous Si surface layer containing Zn nanoparticles with an average size of 4 nm, below which a radiation-damaged layer 50 nm thick is generated. After 800°C annealing in an oxygen atmosphere, a recrystallized single-crystal silicon layer with a complex ZnO/Zn2SiO4 phase is formed. After 800°C annealing in a nitrogen atmosphere, a recrystallized polycrystalline Si layer involving Zn nanoparticles is created. Original Russian Text © V.V. Privezentsev, V.S. Kulikauskas, V.V. Zatekin, K.D. Shcherbachev, N.Yu. Tabachkova, K.B. Eidelman, S.V. Ksenich, A.A. Batrakov, 2017, published in Poverkhnost’, 2017, No. 6, pp. 56–65.